Sadly, when I was asked to create this tutorial I had already painted most of the background. For this reason ‘how to paint the background’ will not be covered. It is anyway, a different method of creation compared to that of Celegorm and Huan. I’ll make a tutorial on background painting at a later date. I also won’t be covering how to create the sketch. I will mention though that the sketch does not have to have extremely clean edges, like in a cartoon or anime style, because the sketch ‘feel’ is necessary to make this style truly work. 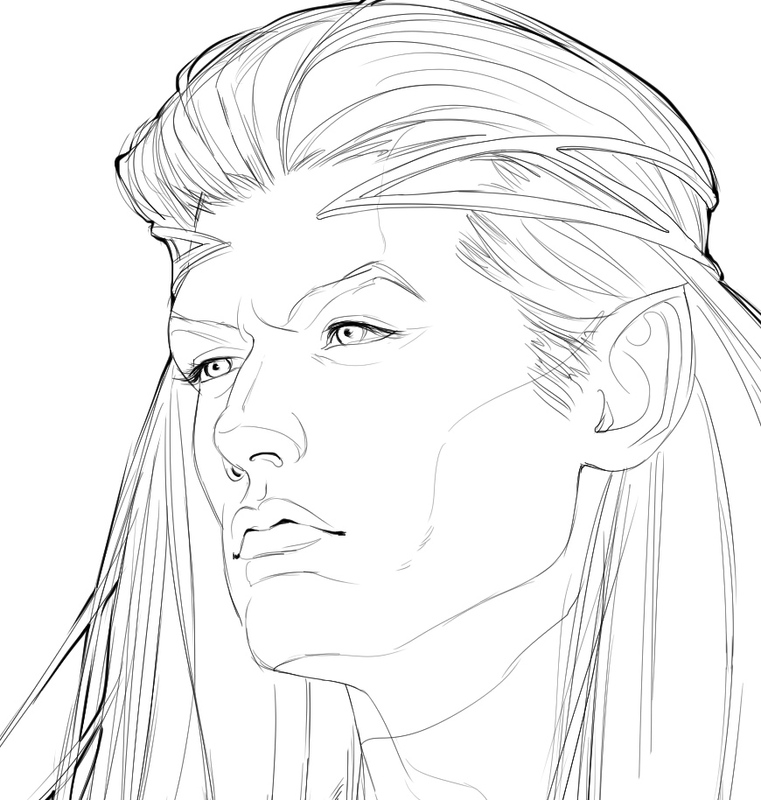 I always draft and finalise these sketches in Manga Studio 5. I find, it’s truly the best software for sketching. Also important to note is that this style only works if you work at large canvas sizes. Anything over 9,000px. 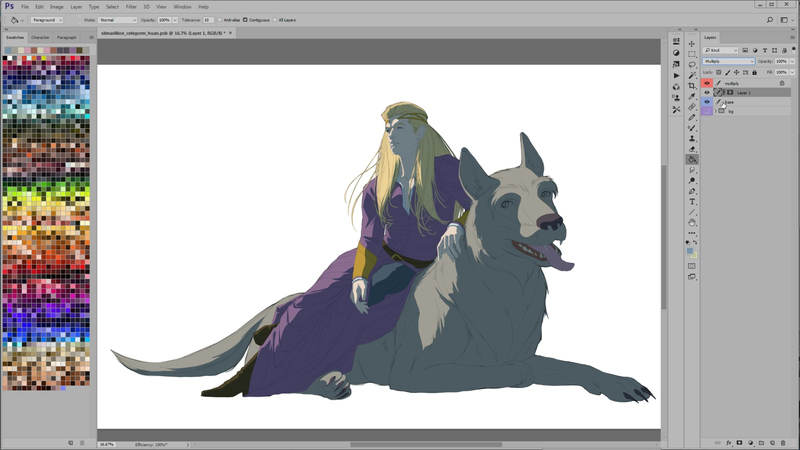 Most of these illustrations are around 14,000px at 300dpi. 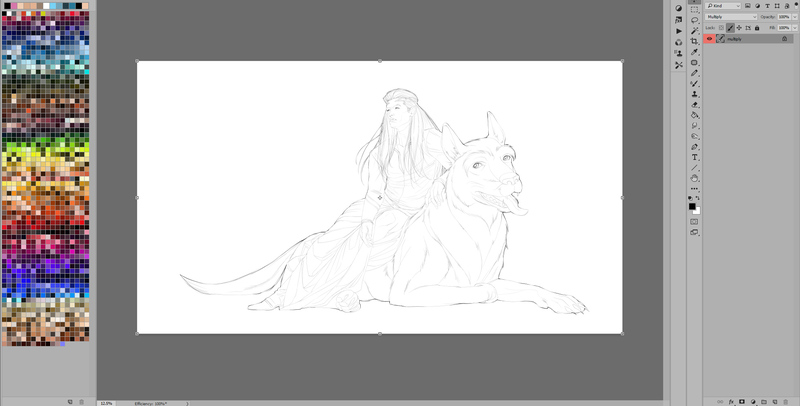 Once the sketch is done, it’s opened in Photoshop, with the sketch layer set to Multiply. I also lock it with Lock Image Pixels so I shouldn’t draw over it by mistake. I create a new layer beneath the Multiply layer, called “Base”. 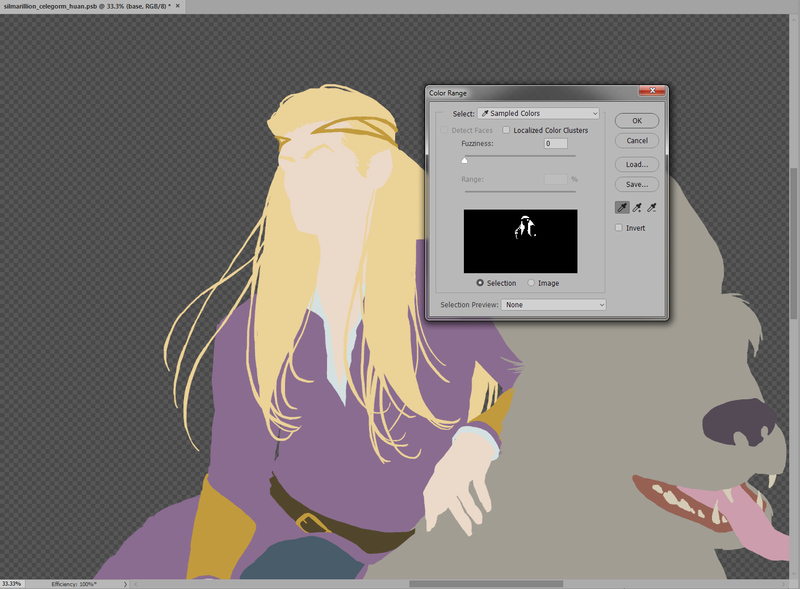 Quick note; I use colour codes to distinguish between the types of layers. 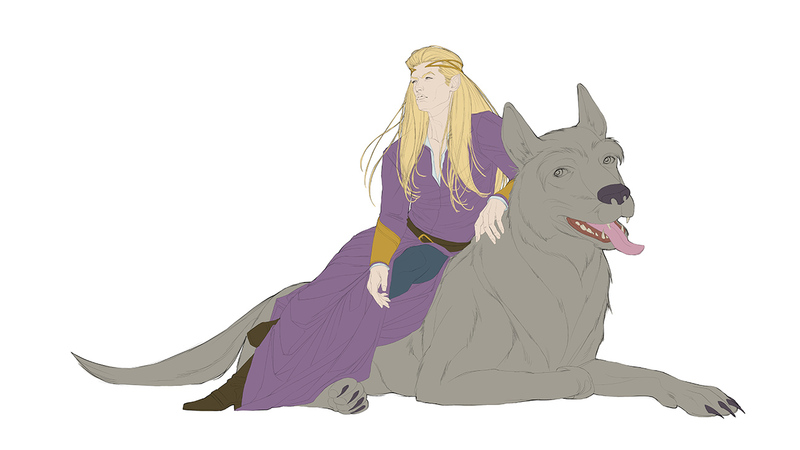 Sketches are always Red, bases are always Blue, and backgrounds are always Purple, etc. On the Base layer, I start painting in the ‘base’ colours. 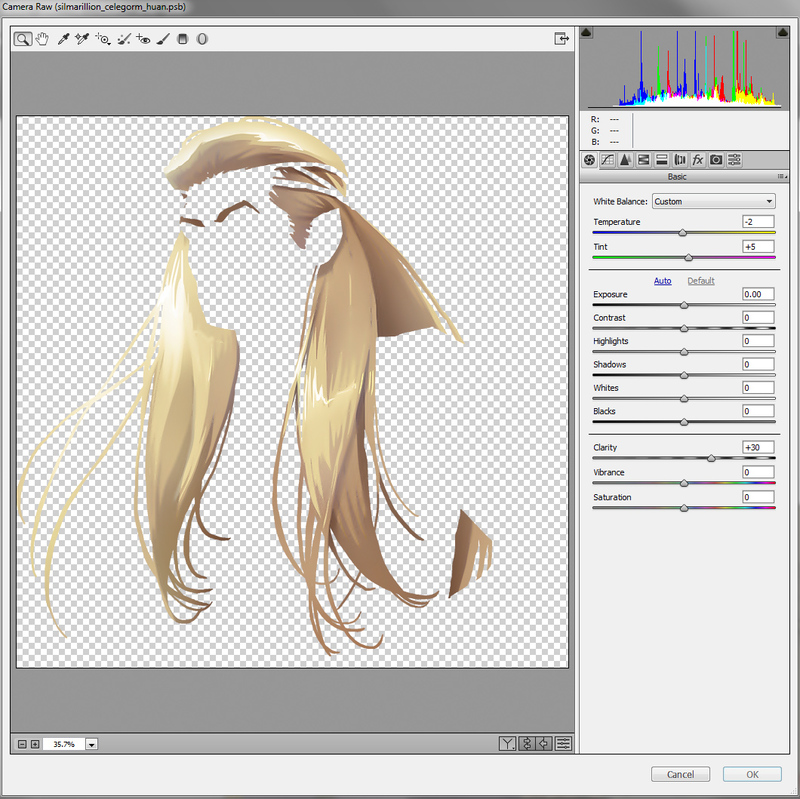 The Pencil Tool in Photoshop must be used for this together with a hard-edged brush. 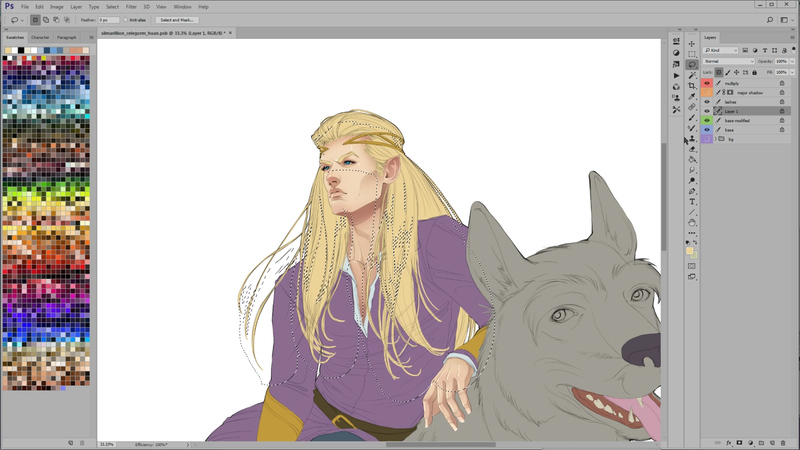 I use this base layer later on to easily edit parts of Celegorm and Huan. The crux of this style is the effective use of the Lasso Tool. The Lasso Tool‘s feather setting is set to 0px, and Anti-alias remains always unchecked. 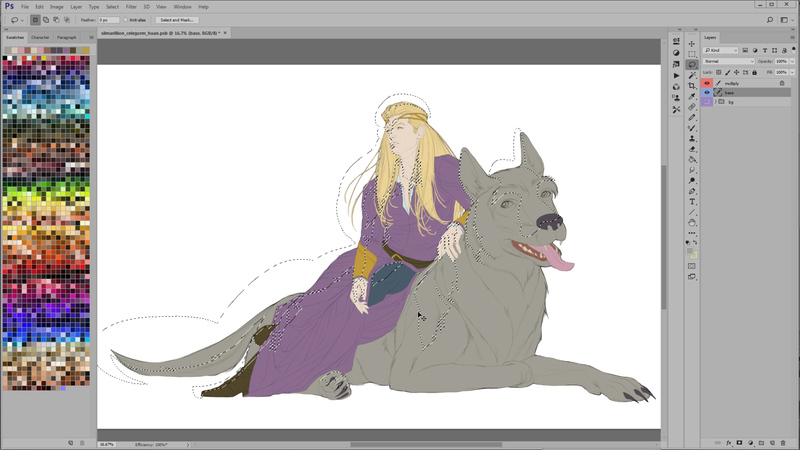 Using the Lasso Tool, I “draw” the highlights in on the parts on Celegorm’s and Huan’s bodies that will have the most light on. Then I hit Ctrl+Shift+I to invert the selection, and fill the selection with a blue colour. 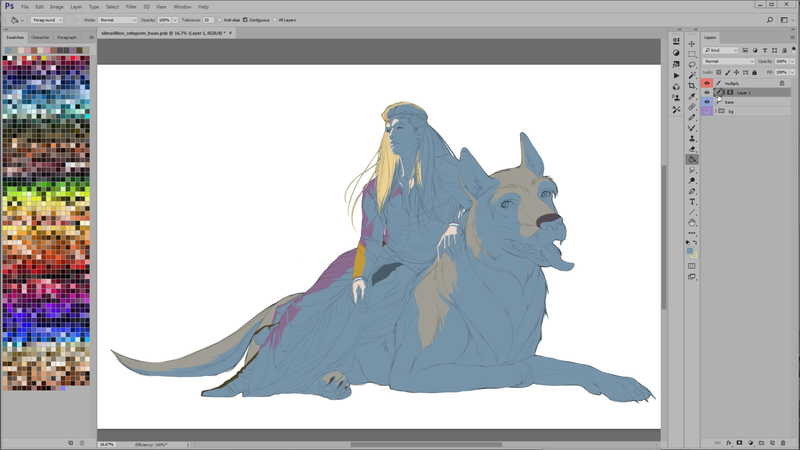 I create a selection of the base layer and, by adding a Layer Mask, I clip out all the bits of the blue that will not be used. 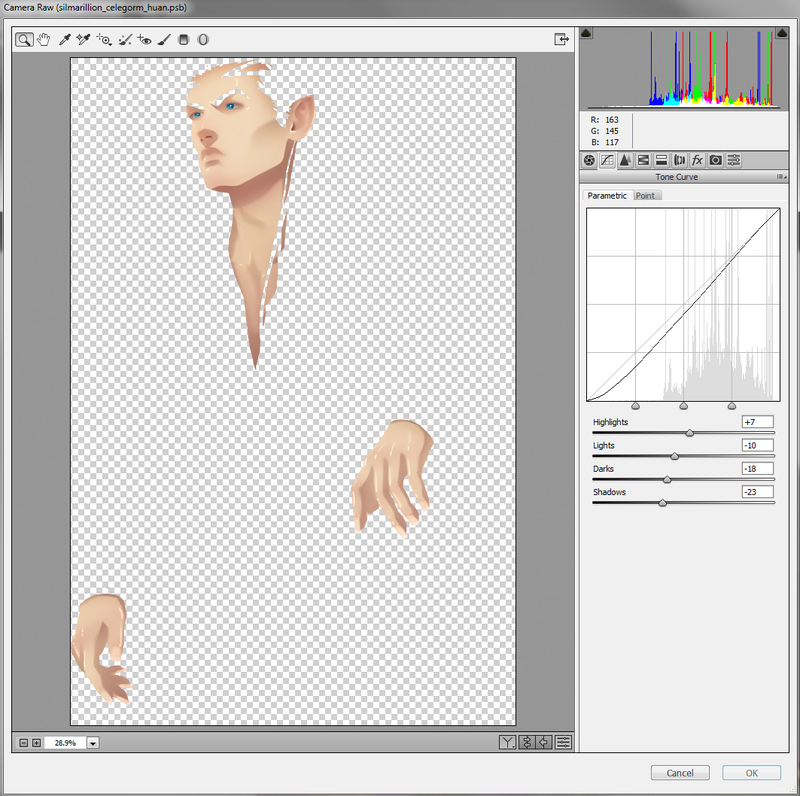 Then I set the layer to Multiply. This creates a “main” shadow that will help me define direction of light, and also the intensity of shadows and shapes on the two characters. 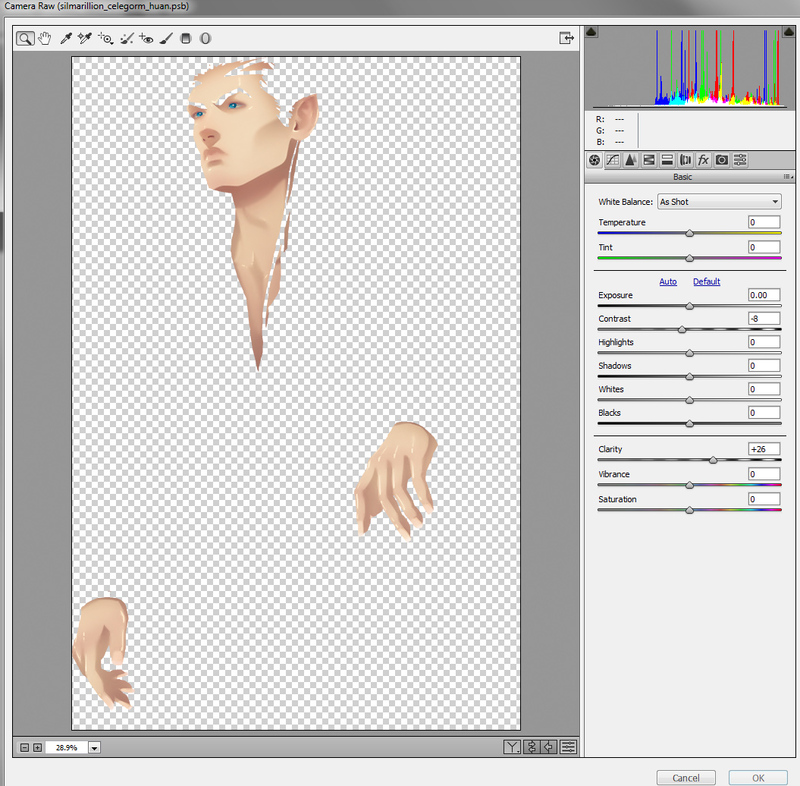 I duplicate the Base layer, and rename the new layer “Base Modified”. Both layers will now be locked with the Lock Transparency Pixels. 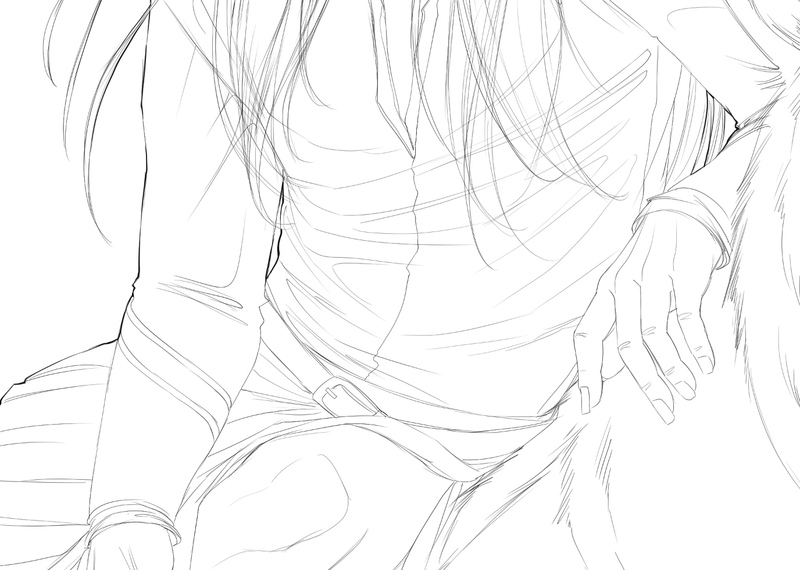 I never draw over the Base layer. That must remain untouched. 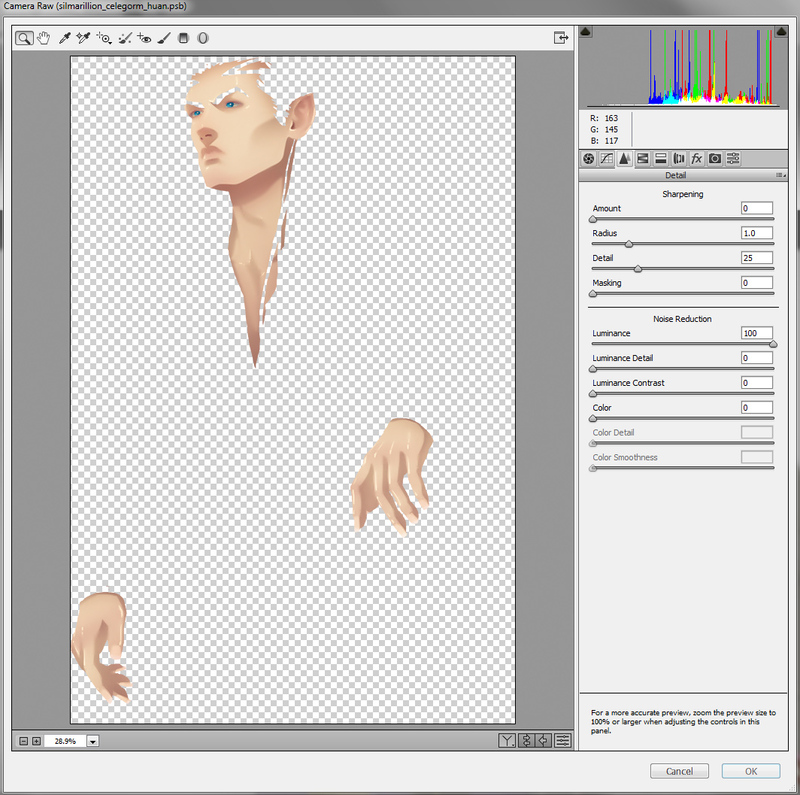 Now using the Select -> Color Range… set to 0 Fuzziness, I select the skin colour from the Base layer and, hitting Ctrl+J, I duplicate it creating a new layer. Again, I lock the Transparency Pixels. 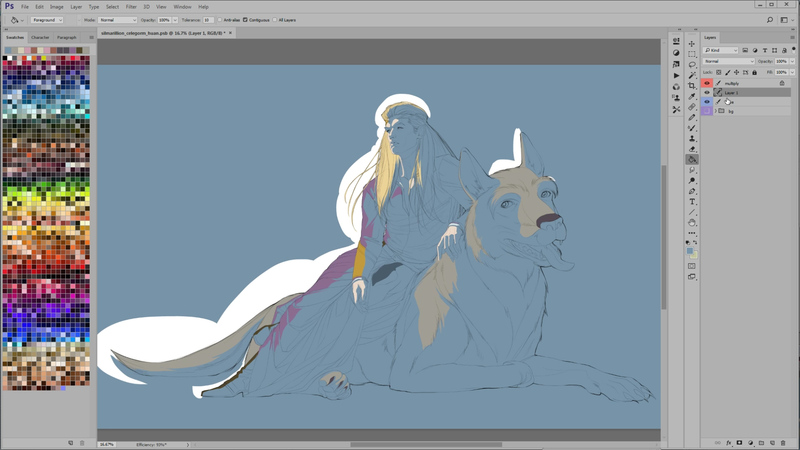 This new layer is the layer I will be drawing on. Next comes adding the shading to the skin. 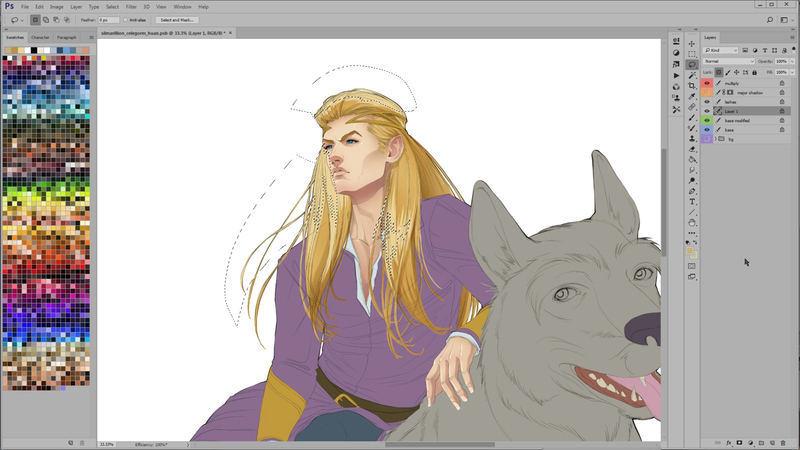 So as to keep things simple, I shall focus upon Celegorm’s face and hair only, but you can see the full process of this painting in the video at the end of this post. Back to the face and the trusty Lasso Tool. On Celegorm’s face I select all the major shadow areas. I hit Ctrl-H to hide the selection. It’s still there, just invisible. 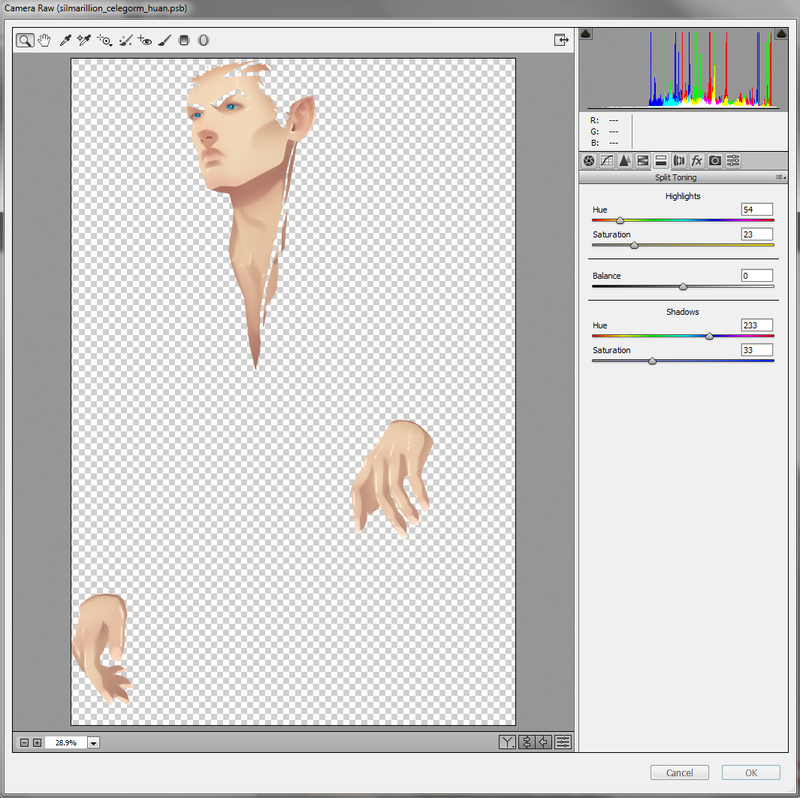 I then select my Paint Brush Tool and using a large Soft-edge brush, set to Multiply, I sample the base colour of his skin and gently shade in the shadows. 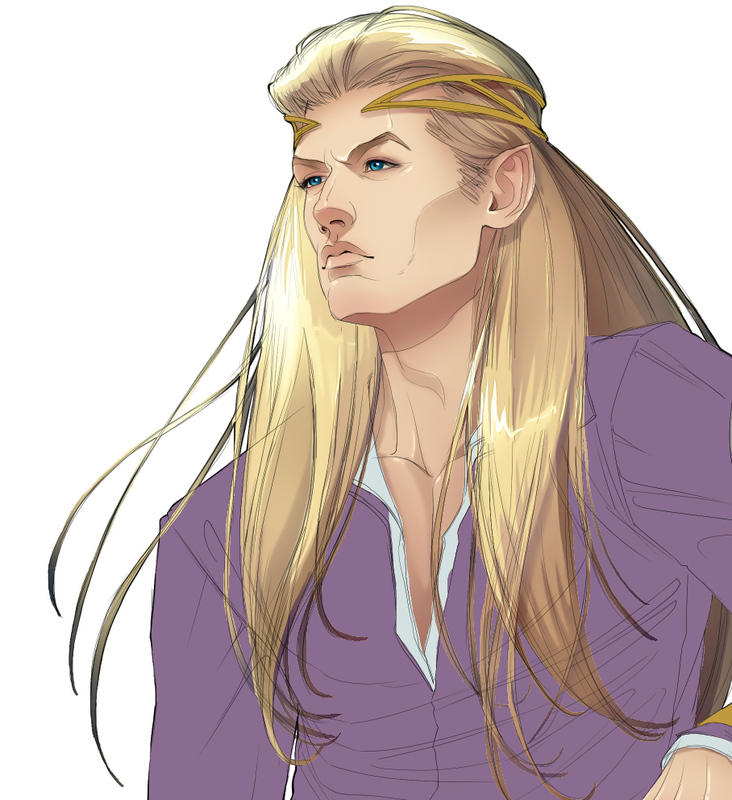 On some edges, like the tip of his nose, the line of his jaw, the top of his brows, I apply more pressure to make them darker, so as to create a soft gradation. Next, using the Lasso Tool, I select the secondary shadows, like his temples, his cheek, etc., and paint them in with the same soft-edge brush, set to Multiply. I hit Ctrl+D to deselect my previous hidden selection, and using the same brush as above still set to Multiply, I choose a pale pink colour and paint in some faint pink shadows on his nose, cheeks, ear, and chin. Switching to a hard-edged brush, I set it to Normal and paint in the eyes. 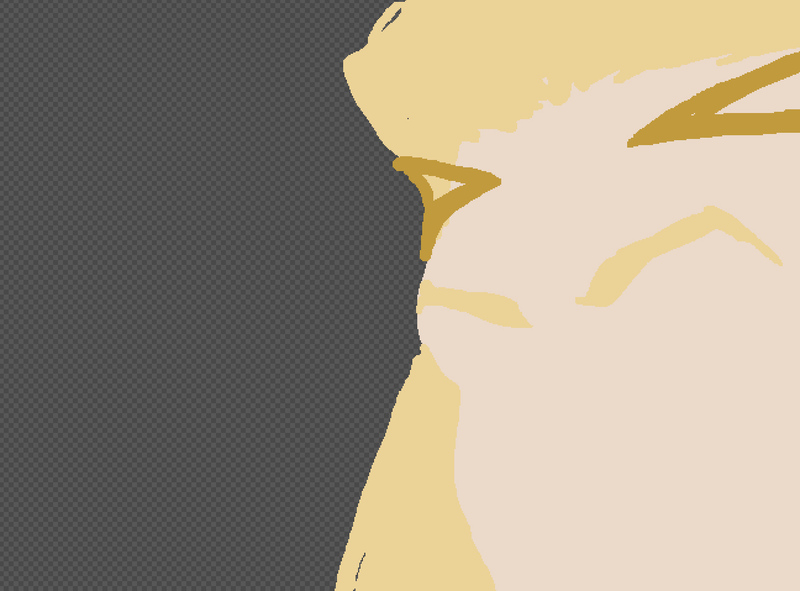 Using the Lasso Tool again, I select a wide area around the eyes, and with a soft edge brush, set to Multiply, I paint in some soft brown shadows around his eyelids. Sort-of a “smokey eye” make-up effect, just to emphasize the characters eyes a bit more. Finally, going back to my hard-edged brush, I sample the base skin colour again and, setting the brush to Overlay mode, I start painting in dots of highlights on the skin and lips. 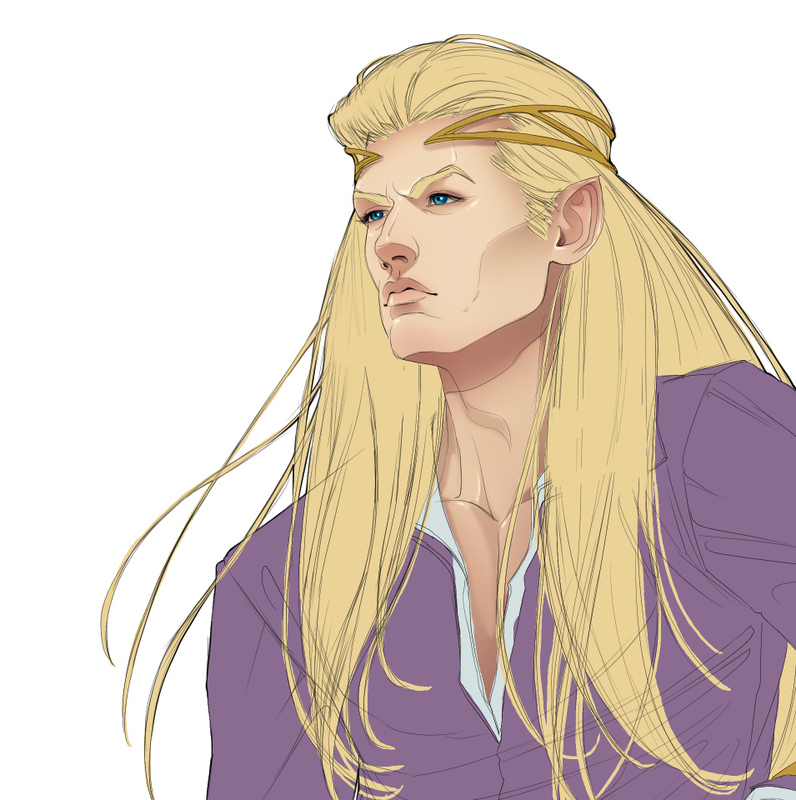 With this, the skin is done. 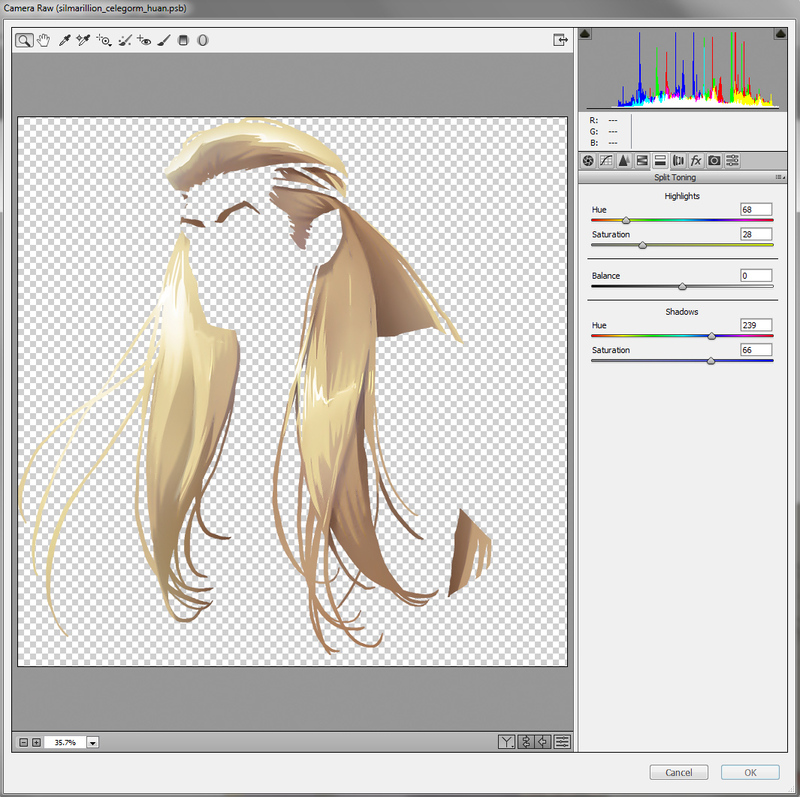 Next, using Select -> Color Range… again, I go back to my Base layer, select the hair colour, then hitting Ctrl+J, create a separate layer of the hair. 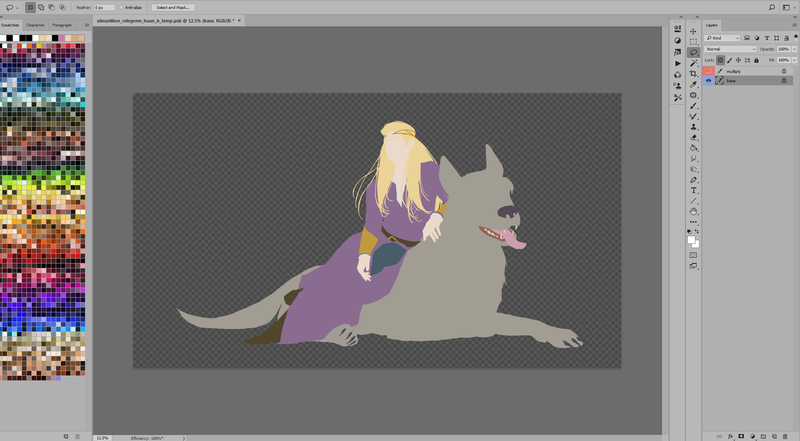 I lock the Transparency Pixels and, using the Lasso Tool, I select all the shadow areas. 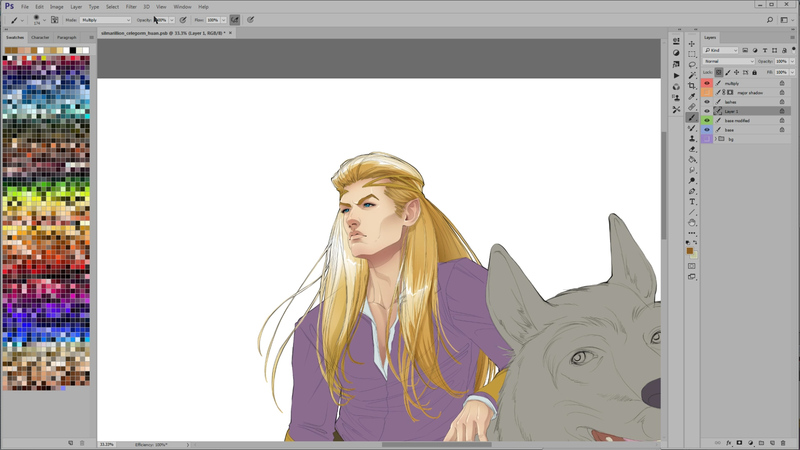 Ctrl+H to hide the selection, and with the soft-edged brush set to Multiply, I paint in the hair shadows. 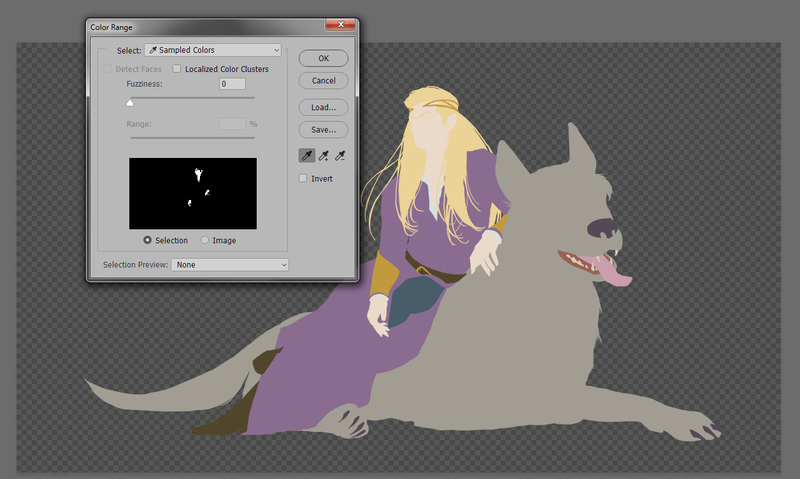 Using the Lasso Tool I select the highlights. I paint in the highlights with the usual soft-edge brush, but this time set to Overlay using a pale yellow colour. One point I’d like to make about Camera Raw; the settings vary, depending on what achieves the best effect. So playing around with all the settings to see what results can be achieved is recommended. Camera Raw is by far my most favourite “Filter” in Photoshop. 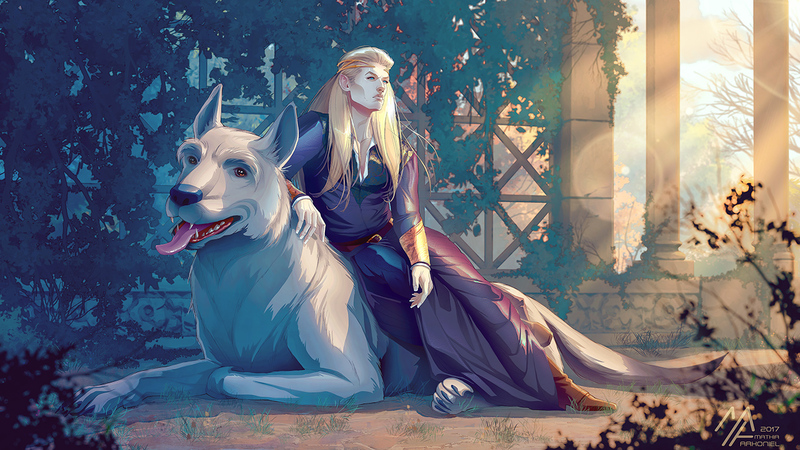 All parts of Celegorm and Huan went through this process from his robes, to his arm-guards to Huan’s fur and tongue. Once everything is done, I start adding some textures to the clothing via the “Add a Layer Style” button, using Pattern Overlay. There are of course, other ways of adding textures, like dragging and dropping them in, but I prefer the Pattern Overlay more. I hope this was somewhat helpful in explaining how I paint my illustrations. Also, in the video you will have noticed me flipping the canvas horizontally quite often. This, I find, is mandatory to refresh your “eyes” and see any previously unnoticed mistakes. If you have any questions, please don’t hesitate to ask. I’ll help wherever I can. At a later date, I shall create a tutorial on how to paint the background, which as mentioned at the beginning of this post, uses a different method than what I use for the characters.